Four TABLES of memorials are available. 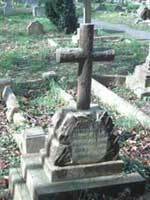 Details of each inscription are on the CD-ROM obtainable from the Oxfordshire Family History Society. 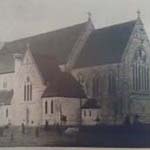 Amongst significant individuals are Father Benson, the founder of the Society of St John the Evangelist; John Irving, the first headmaster of Ss Mary & John School; Thomas Gray, a local builder; Alfred Mardon Mowbray, the architect who designed the church; George Wildon Pieritz, a former rabbi who became a priest and missionary; and Henry Woodward, tailor and outfitter, co-founder of Shepherd and Woodward Ltd on the High Street. Examples of organizations represented are: The Sisters of the Holy Childhood; All Saints Sisters of the Poor; the Society of St John the Evangelist; local schools; the workhouse - Edwin Cole and Lucinda Stedham were the workhouse master and matron, and the workhouse chaplain is also buried in the churchyard; and Bartlemas house and chapel, formerly a medieval leper hospital, which is linked by the inscription on Annie Miller's gravestone (died 1883, aged 34) which indicates that she had leprosy - also a link to the public health issues in the area. The occupations and trades in the area ranged from professional to manual workers and reflect the circumstances of the time. Many local people worked in the university as college servants, others worked in the building trade, and there are librarians, bakers, grocers and nurses. Other interesting occupations include: paviour (a person who laid paving), printer's compositor, tailor journeyman, sub-conductor of Bengal Ordinance Department. Occupations such as coachmaker, whitesmith and blacksmith have disappeared from the area. Yet some have probably been re-named, such as Inspector of Nuisances, now under the auspices of environmental health. Similarly, lunatic asylum attendants would now be considered mental health nurses. 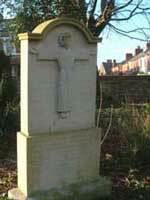 There are a large number of priests and members of religious orders buried in the churchyard. Some were not directly associated with the area. Most of those listed in this table were killed on active service, or died later from their wounds during the First and Second World Wars. However, other military personnel are also included. There are areas in the churchyard where there is a concentration of children's graves from different historical periods, for example: west of the church towards Leopold Street (F57-192), alongside the woodchip path parallel to the central path (D2A-D23A) and next to the church on its south side (A240-244). 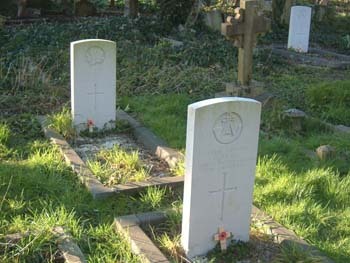 Some children are buried with their families in other parts of the churchyard.